If you've always wanted to hang the blood of Ultima creator Richard "Lord British" Garriott on your wall, now's your chance. We've seen some pretty odd video game tie-ins over the years, but I don't think I've ever seen a developer willing to actually give away his blood before. But that's just what Richard Garriott, the creator of games like Ultima, Tabula Rasa, and the upcoming Shroud of the Avatar, is doing. Well, he's selling it, not giving it away. 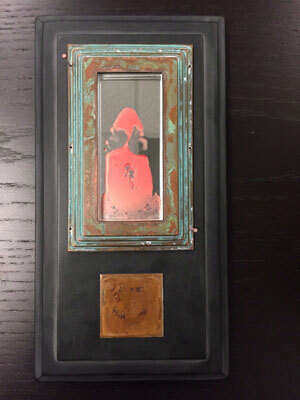 For only $5,000, you can get your hands on one of six copies of the "Lord British Blood Reliquary Original Art by Steve Brudniak." It's a wall hanging that contains the actual blood of Richard Garriott. In addition, anyone who buys one of these six pieces will receive a long list of digital goods for Shroud of the Avatar. You'll also get a chance to visit the Portalarium offices in Austin, TX, although travel is not included. You can even watch Garriott get his blood drawn live in this video. If you're a huge fan of Lord British, or you just want one of the stranger game-related items in recent memory, you can pick up the Lord British Blood Reliquary on eBay.